I even understood 10% of it, it was so well explained! I'm learning a lot right now while I make this so plase add me to the prehistoric group of people here. Ok so let me say that I have changed a lot of the previous post because I think I was falling into another missconception again. I profited the situation to add some more text to my post and graphs so now it might be clearer. Sorry I was wrong in a few subtle things and maybe there was some confusion. And also sorry for it been so long (I don't know if I can get it less complicated since the phenomenon itself is a bit complex). Watsisname if you are going to take some idea for the next topic, please take a second read now because I changed a lot of things of the final parts (also because I'm still thinking that there is wrong assumption somwhere ), maybe there is some new idea you might be interested in. I've always suspected that Jupiter rotation and Io's tidal heating contribute to the mechanics of this ond not only the 1:2:4 resonance (which I don't even comprehend). Tidal heating has to circularize Io's orbit and Jupiter rotation has to expand it as far as I understand but I can't understand how it is all connected (if it is). Maybe if we (all) continue to work on this thread like this we could make a pdf copy with a synthesis of all the explanations of the thread one day and post it somewhere. Now I want to make some simulations with the Galilean moons. I'm very excited by this, thank you. I feel like a child. I think there is always a time in our lives where we realize we are all just a bunch of clever apes trying to understand this elegant, beautiful universe - that even if we had lifetimes (and we actually have), we would not even scratch the surface, because with every discovery we make, greater scientific wonders and mysteries beckon. That is the most important time. Unfortunately some people never have that moment, and become dangerous ignoramus' who think they know everything. Gnargenox, that is hilarious. But what I really see are three apes. 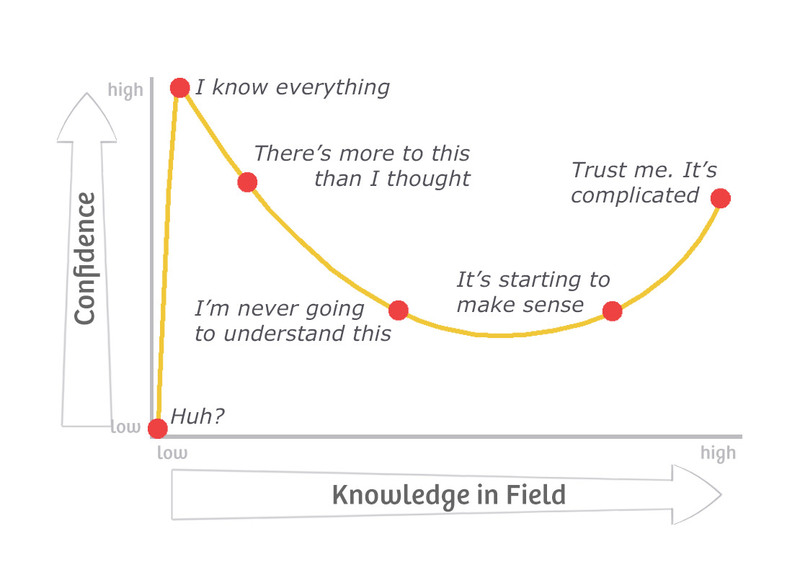 As ape brains we have a tendency to follow the Dunning-Kruger curve, and I think this thread is a great demonstration of the effect in action. I'm at about the second from the far right dot. I previously shared this in the science videos thread, but I'd like to copy it here as well, as I think it fits nicely with the themes of this thread. In this case, our efforts to understand the physics of planet and solar system formation. Most of this physics is pretty well understood and connected with observations, but there remain some surprisingly difficult hurdles. For example, it remains poorly understood how roughly 1cm sized objects (pebbles) are able to grow into kilometer-sized objects quickly enough to go on to form planets, before being swept down into the central star by drag with the gas. There are many problems with understanding the timescales of planet growth especially in the sense of how it can happen so quickly. This talk goes over some of the insights that have been recently gained from combination of models and high resolution observations of young disks with ALMA, and it's really quite fascinating. I think it is also presented well enough (and not overly-technical) that it should not be hard to follow if you have time for it. Source of the post I previously shared this in the science videos thread, but I'd like to copy it here as well, as I think it fits nicely with the themes of this thread. Very interesting, and further reason to be skeptical of the common claim that gaps in these disks have 1:1 correspondence to planets. I know the focus of the TED Talk is the talk itself, but I couldn't help finding myself wishing for more visuals and references to the hard data throughout. So here's the paper to go with it. Pretty neat stuff and I'll have to give it a more thorough read later. That's a really interesting theory. When i think about it, it seems to line up well with the observations.